The Myasischev M-50 and the "Soviet Nuclear-Powered Bomber"
The airplane sighted by the Western observers was actually the Myasischev M-50 (later given the NATO designation "Bounder"), a prototype supersonic heavy strategic bomber powered by four huge but entirely conventional chemically-fueled turbojet engines. 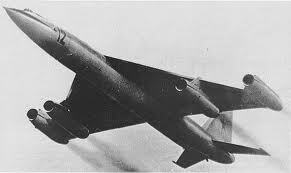 It was displayed in a public flyby at the Tushino airshow in 1960 and was cancelled shortly thereafter. It is now on public display at the Russian Monino air museum. A Russian 3-view drawing of the M-50 compared with Aviation Week's drawing shows the gross inaccuracies that resulted from the poor data available to the magazine. However, there is an intriguing detail in the drawing: the number on the fuselage near the nose reads "54." The M-50 was itself a flying prototype for what would have been a fully-operational Mach 2 strategic bomber known as the M-52. The fact that the designation "54" would be the next in succession may or may not be a coincidence. No number is visible on the "tourist photo." One factor behind the conclusion that the new Russian supersonic aircraft was nuclear-powered was probably the fact that Convair, Lockheed and Boeing had all conducted studies on nuclear-powered supersonic bombers with superficial similarities to the M-50. So the "Soviet Nuclear-Powered Bomber" affair was a mistake -- but then where did Aviation Week get its information on the plane? Former editor Robert Hotz, who decided to run the story in 1958, was interviewed by researcher John Tierney in 1982 for an article on the NEPA project and revealed that his sources were leaks from "US government officials." Clearly some in government and the NEPA project stood to benefit by Soviet-provoked acceleration of the project, as many other aerospace projects had in the post-Sputnik era.